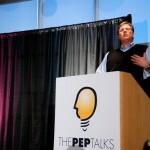 In 2009, for roughly a year, I created and hosted The PEP Talks (PEP stands for Passion, Experience, People). These events were quarterly speaking engagements that showcase local professionals who are passionate about what they do and are eager to share their wisdom to students. Much of my success in life was due to the guidance and friendship of a mentor. My hope in creating The PEP Talks was to create an environment where students and professionals could connect on an equal playing field – not an interview, not at work, not at school. Each event featured 5 speakers talking for just 20 minutes with an open networking session afterwards. Each talk was professionally video taped and posted on the site. Each event was electric. Students and professionals from all walks of life sharing experiences, swapping phone numbers or business cards, energizing each other. Of the hundreds who attended the events, at least a dozen students walked away with either a lead on an internship or a potential new mentor. Thousands of visitors came to view the talks, and each clip was shared across various social networks. Learn about the Business Builders Club – an entrepreneurial student organization – from Robert Nicholson and Luke Barbara. Please visit www.businessbuildersclub.org. Being curious and creative, seeing patterns, and envisioning the future. These are just some of the skills needed you need to determine what makes good design. Chris Rockwell talks about how successful design is rooted in understanding people’s experiences. 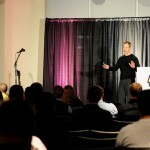 Chris Rockwell is a national expert in usability, design research and consumer behavior. Know why milk is always in the back of every grocery store? Or why they put mirrors in elevators? Chris does. Big companies hire him and his firm, Lextant, to analyze how you and I interact with their products by asking questions and observing behavior. Every industry can benefit from understanding the needs and wants of their end users. Software, web sites, store traffic, electronics – anything can be improved with the help of Chris and his team. Artie Isaac is a career marketer and entrepreneur. He is the co-founder of the Young Isaac Advertising Agency and co-founder of SpeakerSite.com – the world’s largest social network of public speakers and event planners. Artie is an accomplished public speaker and is an adjunct professor at The Ohio State Fisher College of Business MBA program, Otterbein College and CCAD. Pretty much everyone knows Artie, if not for his many accomplishments but also for his steadfast ambition to bring the bow-tie back in style. Jared Mahone talks about the similarities between traditional entrepreneurs and independent musicians. He encourages us to be independent in all we do, regardless of our path in life. We also get a taste of his “beat-boxing” skills as he performs one of his compositions. Few musicians these days write their own music or play their own instrument. Fewer still actually own their own music and enjoy creative freedom. Jared Mahone is such a musician. There’s no doubt he’s a talented singer, songwriter and performer. But Jared is also passionate about mentoring other musicians – encouraging them to own the rights to their works and to promote their talent independently. Don’t miss any of his shows and support talented local musician such as Jared by buying his CD here or on iTunes. Having worked in four different industries, three startups, fired twice, laid-off once, and over 26 bosses, Randy Dean shares what he has learned from his career. Randy also talks about how making sacrifices now can pay off later – like it did for his Oscar-nominated high school classmate. Randy Dean is in the business of finding talent. Not the next American Idol – but perhaps a rockstar project manager or a kickass .NET programmer. Randy is President of Fast Switch which provides IT consulting services, product management and executive recruitment for companies large and small. Randy has a passion for working with fast-growing technology companies. If you want to know what it takes to make it in the IT world – ask Randy. He has his finger on the pulse of technology in our community. Sr. Director of Marketing at Prevedere, Inc, big data evangelist, mobile device junkie, closet chef, recovering musician, public speaker, entrepreneur, author.